Like I said, my name is jen, i'm 22 and I'm a graphic designer and work in a flower shop part time. I've lived in Iowa my whole life and attended college in Omaha, NE. I like to scrapbook, paint, drawn, work with stained glass, read a good book, watch funny movies and relax. 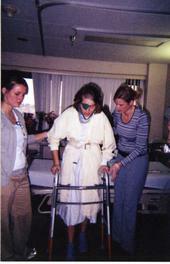 I was in a car accident December 22, 2005 that changed my life. On how I view life mainly. I believe all things happen for a reason, we might not know what God has in plan for us...but he does. I suffered tbi and many other things to say the least, I have gotten through these with having faith and looking on the bright side. My husband, family and a few of my close friends have also helped so much.